Are you a Chicago Cubs fan? If you are, haven't you ever dreamed of being able to watch the game with a better view? Ever heard about Sheffield Baseball Club? If you still haven't, better check them out! Sheffield Baseball Club offers you a great baseball experience. It stands just 454 feet away from the home plate --- so near that you will never miss any baseball moment. 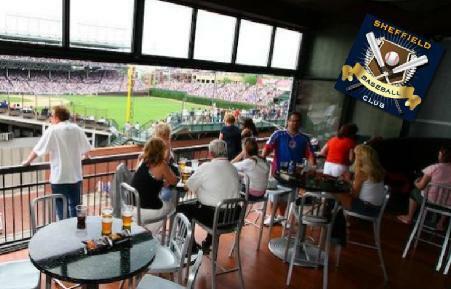 The outdoor rooftop area is spacious and can accommodate up to 200 Chicago Cubs fans. If you feel like staying indoors, each level [consist of three] has a bar area with wall mounted television sets all over the place. Not only that. If ever you need to take a toilet break, you will never miss a second of the game since there are flat screen tvs in every toilet! Take a toilet break whenever you want to without worrying about missing any second of the game. How awesome is that? The next time you watch your favorite Chicago Cubs play, see them play in style. Check out Sheffield Baseball Club! You made my day talking about my favorite baseball team! I will be checking out a game at Wrigley Field before too long although I have been by the park before. My friend named Kenny, who I went to high school with, has watched a game from the Sheffield Baseball Club. He liked it A LOT! Thanks for the award Khim! Haha! Good to know! I haven't watched a baseball game but will sure do when we visit the US! Might be next year of a couple of years from now. Can't wait! Hope all is well with you my blugging friend!